Where are the Best Places to Lighten Your Car For Increased Performance? Read This and Find Out! “A pound of rotating weight is equal to ten pounds of static weight”. Or seven pounds. Or three pounds depending on who you ask. And they’d all be correct and incorrect. As with so many things in life, “it depends.” We are going to look into the concept of mass factor and figure out where you get the most bang for your rotating mass reduction buck. Isaac Newton and physics tells us force equals mass * acceleration (F=ma). This equation is basically the definition of inertia. The more mass there is, the greater the force is required to accelerate that mass. Therefore, more mass = more inertia. When it comes to cars, a straight application of F=ma does not work because there are many round bits that spin such as wheels, tires, flywheels, clutches, pulleys, etc. The equation for making round things spin faster about an axis is torque = moment of inertia * angular acceleration. With vehicles, it gets complicated because we have to apply force to get it to accelerate in a direction plus apply force to get the round things to spin. There is a concept called mass factor which calculates an effective mass that takes into account the inertia of all the rotating parts. For example, a car may have a mass of 3000lbs, but when you take into account the inertia of all the rotating bits, it’s like trying to accelerate a car that weighs 4000lbs with no rotating parts. For those of us who like to accelerate faster, we’re going to figure out the best places to reduce mass of the spinning bits to gain the most acceleration and learn about the concept of mass factor. Visualize a tire. If you tried to apply just F=ma in calculating how fast you could get the tire to accelerate along the ground, you’d end up with the wrong answer because you’d leave out the force required to also make the tire spin. We can use a yo-yo as a great example. If you just dropped the yo-yo, it would accelerate due to the force of gravity, f=mg where gravity (g) has a value of 9.81m/s^2. Now take that same yo-yo and let it fall down while unwinding from the string. The yo-yo will fall down slower because some of the force is going towards making the yo-yo spin. So, it’s the same with all the parts that spin on a car. We’re going to start off with a little bit of math and then crunch the numbers to see how much the rotating bits of a car contribute to the mass factor. I’m borrowing this slide from my old professor Dr. Longoria at the U. of Texas at Austin from the course ME 379M/397 Cyber Vehicle Systems. 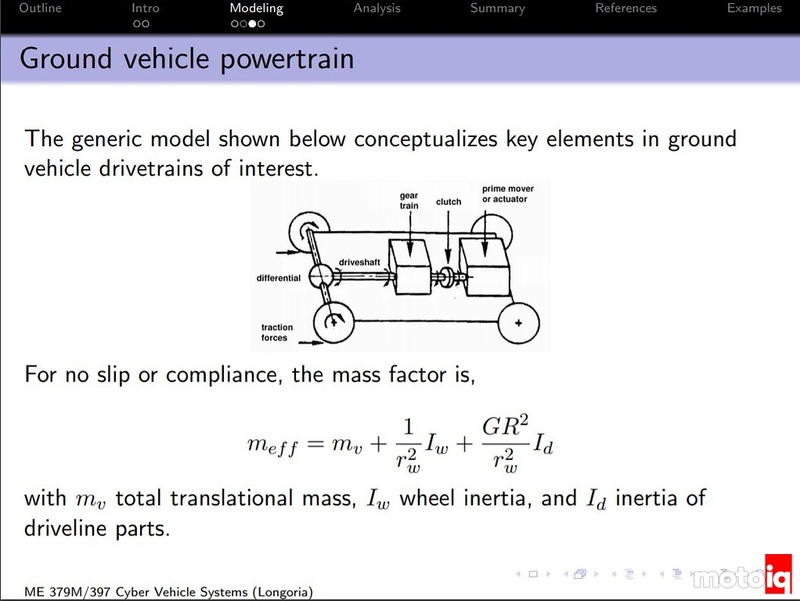 It’s part of a presentation on vehicle performance modeling that you can download. It shows the math equations for the 2d motion of a torque driven wheel. The first equation is F=ma for the Force causing translation in the x direction. The dot over the ‘v’ basically means the first derivative; so, the derivative of a velocity profile/equation is acceleration. The second equation says that Force Z is equal and opposite of the force of gravity, so the wheel isn’t going up or down. So, no displacement in Z direction. The third equation says that Torque_d minus the torque created by Ftx * radius of the wheel (remember, torque = force * distance) is equal to the rotational inertia times the derivative of the angular velocity (= angular acceleration). This slide shows a few of the rotating bits to be taken into consideration along with the equation for mass factor. Of importance, note that all the rotating parts that are spun up by the transmission (flywheel, clutch, engine) are multiplied by the Gear Ratio (GR) squared! Remember, gears are torque multipliers. 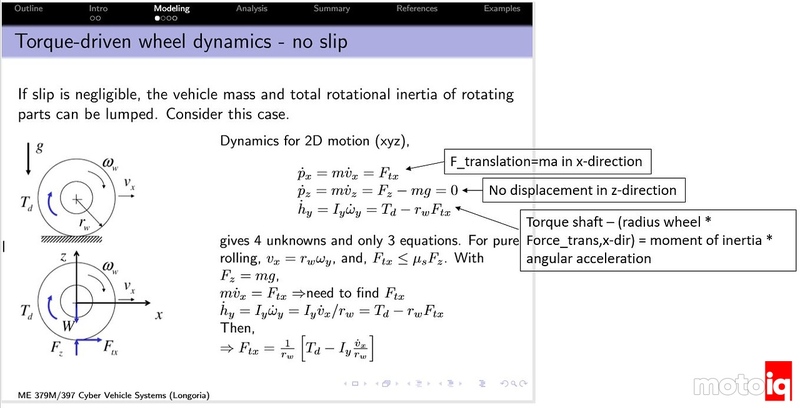 As the equation is written in the slide, it calculates the effective mass which is equal to the vehicle mass (mv) plus the effective mass of all the rotating parts. 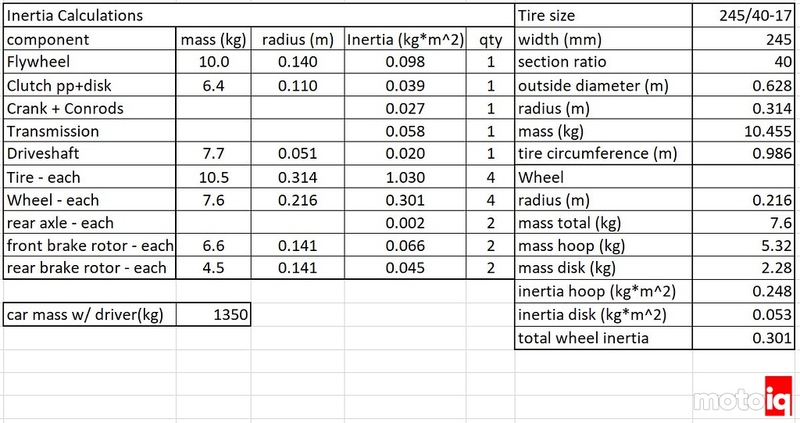 I made approximate (lots of assumptions…) calculations for the big rotating parts of Project S2000 and assumed a vehicle mass for 1350kg with driver based on my corner weight session. A paper titled, “Problems of Rotational Mass in Passenger Vehicles” that you can download calculates a mass coefficient which just divides all the terms in the previous mass factor equation by the vehicle mass. Notice the flywheel has the most inertia of the engine connected parts because it’s fairly heavy and has a big radius. Inertia is a function of radius^2, so having a lot of mass out at a far radius exponentially increases the inertia. Comparing the tires to the wheels, the tires only weigh about a third more but have around three times the inertia because the mass is all hung out at a larger radius. The crank and rods account for much less inertia compared the flywheel. how bored were you when you decided to figure all this out? Enough that I spent over 20 hours on it 🙂 It was a fun little mind exercise and I happen to have some free time right now. That is exactly the road i am going on my s13. 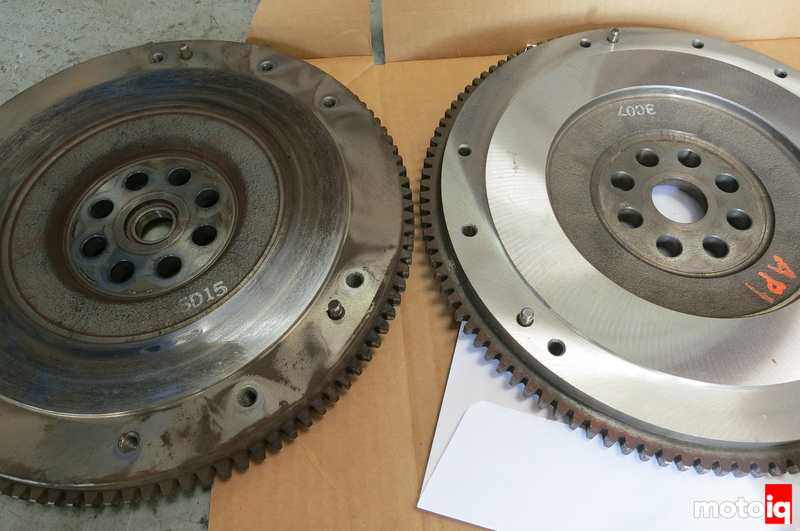 stock flywheel is ~25lbs, i got an 8lbs one, which supports 7.25″ twin plate clutch. Which also happens to weight a lot less than stock, i thing that was about 12lbs lighter. The engine is getting built, strangely the forged rods and pistons weight less than stock. This is going to rev easily ! Why “strangely”? Stock rods and pistons are usually cast. it is normal that forged rods and pistons are lighter than stock. But this ‘geeky stuff is what separates the best from the rest. Ah yes…. the college days. Something not cereal for lunch and nicer bike part or more cereal for lunch 🙂 I only had one bike in college though. Got it used when I was an incoming freshman from someone graduating. Univega mountain bike with a carbon tube/aluminum lug frame. Rock Shox quadra fork, Shimano deore xt components. I upgraded the brakes to Avid v-brakes and changed the shifters to SRAM grip shift. Good article, but one thing I’m missing is what happens with energy storage. Lets not forget that the rotating assembly stores energie in the form of enertia. What works for a track car (basically on on-off switch) does not work for a road car (which is far from on-off). What you gain in acceleration, you loose in drivabilty. sustaining speed becomes a lot more erratic. Although I must say that I can live with that. That one thing I can’t live with, is reduced bearing life. Balancing is far more important then getting every last gram removed in the rotating assembly. Sure a car gets quicker the more weight you remove, but at what cost if you go to extremes? Therein lies the real question…. Having said all that: Lightening the flywheel by 1/3 of the weight won’t get you into heeps of trouble..
Yup, the AP1 flywheel is as light as I would go in the AP2 S2000 driven on the street in hilly areas. When the A/C is on, it actually drags the revs down a bit too quickly on upshifts for casual street driving; I have to shift quickly for smooth rev matched shifts. I also live in a hilly area and there’s one hill that’s 13% grade with a stop light on it. I almost stalled the first time starting up it with with the new flywheel. I had to use over 3k revs. There are some ~8lb flywheels for the S2000, but I’d only use that for track cars and/or areas that are flat like Florida. My e36m3 doesn’t rev quickly but the huge dual mass flywheel and meaty torque curve make it a breeze in traffic and hills. However, I can’t seem to find a weight comparison of 17″ vs 18″ tires. I’m thinking that 275/40/17 is heaver than 275/35/18, even when you include the wheel. And if that tire weight is further away from the center then this means that the bigger, heavier wheel is the lighter choice in the end. Am I wrong? Tirerack.com lists tire weights. It’s where I looked up the weight for my RE-71Rs. Interesting, I had no idea that was on there. To my surprise the 18s are either the same or a bit heavier than 17s. Maybe a rounding error or stiffer sidewall construction, but it’s essentially the same weight comparing 35 and 40 profiles. “It was like taking out your average American male as a passenger in first gear”…bwahaha. Great article Khiem, keep up the techy articles! I wish aftermarket flywheel manufacturers would publish the rotational inertia value for their product. They all want to talk about how it’s 10 lbs lighter than stock but some of them have most of that weight removed near the center. Good article, not something you see analyzed often. I’ve done light flywheels/clutches in 3 vehicles and all 3 pulled much harder through the first 3 gears. It’s a go to mod for me anymore. Last one was my C5 Z06, I have the numbers somewhere but it went from around 50# to 30# for the clutch assembly and once again created traction issues in the first few gears. Since I skip gears in that car, I had to adjust my timing like Khiem. Another observation I had was the way the car flares on a startup now that there’s so much less to spin up. Back then I was only concerned with reducing rotational inertia for the purpose of reducing 0-60. I came to pretty much the same conclusions as you did – flywheel weight reduction has the most effect – and also lighter wheels.